Valves are elliptical-clavate with the headpole produced slightly and broadly rostrate and footpole rounded. Axial area is straight, expanded slightly due to a shortened stria on either side of the central area. A single stigma is present in the central area. The internal opening of the stigma opening is offset from the external opening. The raphe is lateral and weakly undulate. External proximal raphe ends are dilated slightly. Striae are punctate, parallel to radiate, number 9-11 in 10 µm and are strongly radiate at the footpole. An apical pore field is present at the footpole. Septa and pseudosepta are present at the poles. 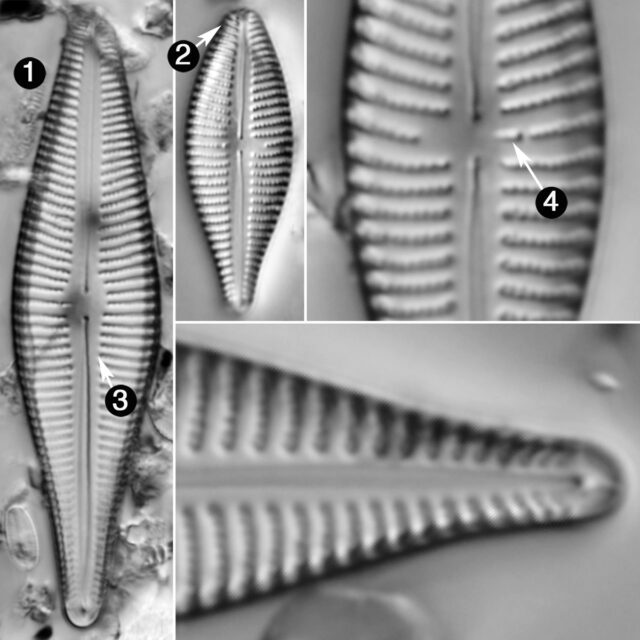 There is no evidence to support Krammer and Lange-Bertalot”s (1986) inclusion of this species within “Gomphonema clavatum Ehrenberg” (compare the forms in plate 163, Fig. 9 for G. mexicanum in that reference). Valves are elliptical-clavate. The headpole is slightly produced and broadly rostrate, while the footpole is rounded. The stigma opening on the inside is quite offset from the external opening. Striae are punctate, parallel to radiate and strongly radiate at the footpole. Septa and pseudosepta are present at the poles.